Plastic is in many ways a wonder material. It’s easy to shape, and it’s strong and cheap to produce. But plastics have also become a major environmental problem. A staggering 322 million tonnes of the stuff is produced every year. That represents 44 kilos of plastic for every single person on the planet (2015 figures according to PlasticsEurope). Much of this plastic ends up as waste in the environment, especially in the ocean. Packaging makes up about 40 per cent of the total amount of plastic waste. Most of what we buy in the grocery store is packed in plastic. “Do we really need to package something that takes five minutes to eat in a material that takes hundreds of years to break down?” asks Vegar Ottesen. Ottesen was a participant in the regional finals at the Researchers’ Grand Prix competition in Trondheim earlier this autumn, where he presented his research on nanocellulose, which could replace plastic in packaging. Untreated cardboard on the right, processed cardboard on the left. “We’re working on finding an alternative solution to plastic, and we actually have the solution in nature: nanocellulose. It’s so harmless that it can even be eaten,” he says, as he swallows a mouthful of gelled nanocellulose to show that it’s risk-free. “The strength and properties of gas barriers are key aspects in my doctoral research,” says Ottesen. “I’m studying the use of nanocellulose fibres as a protective layer on cardboard that could then be used for wrapping foods and other things that need to be protected from the environment. This could potentially replace plastic and aluminium packaging in many applications, especially non-renewable petroleum- and metal-based materials that are used in drinking cartons and the like,” he adds. So why not replace plastics with nanocellulose right away? Cross section of sample showing an approx. 2 μm (micrometre) thick layer of nanocellulose on top of cardboard. Some challenges have to be solved first: right now it’s still far cheaper to manufacture plastic packaging than more environmentally friendly alternative. Another challenge is that nanocellulose is a very wet material that usually contains 99 per cent water. This water needs to be removed before nanocellulose can be used in packaging, for example. Another challenge is the handling of the material itself, Ottesen says. “Getting nanocellulose to stick to cardboard or paper isn’t that easy. Bubbles or holes in the surface coating can occur – and it can easily become brittle and crack when it dries,” he said. But he is well on his way to finding a solution to just that problem. Along with researchers at the Åbo Akademi University in Finland, Ottesen has tested methods for applying nanocellulose to cardboard or paper to achieve a smooth, fine surface. The nanocellulose thus creates a barrier that protects whatever is wrapped in this packaging from external influences. “In our work we used rough cardboard that was uneven and had large pores (see electron microscope image below), and even with just a single layer of nanocellulose we went from an uneven, rough surface to a smooth and even product. The absence of holes and cracks means that the nanocellulose can do its job as a gas barrier,” Ottesen says as he explains the tests they have carried out. He adds that the smoothness and density can also make it easier to apply good graphics like logos and text with less printing ink, as it won’t be absorbed into the paper but will remain on the smooth surface. 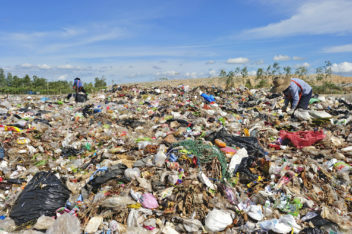 The hope is that biodegradable plastic packaging can help eliminate huge garbage heaps filled with plastic. Photo: Colourbox. Nanocellulose is a unique material that can potentially be used for many different applications, from replacing plastic in packaging, to helping the body to repair damaged tissue or extracting more oil from oil wells. Nanocellulose is nature’s own nanomaterial. Each fibre consists of a bundle of cellulose molecules that fit snugly together. It can best be compared to a rope that is composed of many thin threads. The fibres are strong and allow plants to grow straight and stand upright. The surface is special because the fibres can stick to each other. This allows us to use nanocellulose as tiny building blocks that glue themselves together into small, very solid structures. Tissue engineering entails repairing tissues that are damaged by disease or injury. Three things are needed help the body repair damaged tissues: living cells from the patient, nutrients for the cells and a scaffold for the cells to attach to so that they can form new tissue. Nanocellulose is used to construct this scaffold. In the oil industry, only 43 per cent of oil is collected from oil reservoirs in the North Sea, leaving much of the oil behind. Adding nanocellulose affects the viscosity of the water. It becomes more viscous, creating a different flow pattern. This allows oil from new areas of the reservoir to be extracted. A cross section of Ottesen’s coated sample shows that the nanocellulose forms a layer on top of the cardboard, even over the uneven pores, like a thin skin. “Most materials that you apply to cardboard and paper penetrate the pores, so we expected that to happen here, too. But the nanocellulose we used formed a fine film when it dried, probably because of the number of hydrogen bonds between the nanofibres,” Ottesen says. The research project on nanocellulose involves more researchers at NTNU. It is headed by the Paper and Fiber Institute (RISE PFI), where researchers first discovered and described the gas barrier properties of nanocellulose. This could mean that it will be easy – regardless of the quality of cardboard used – to calculate the amount of nanocellulose needed per square metre of cardboard. It may also mean that the nanocellulose is quite robust and that it can reliably be placed on a variety of surfaces with the same result: a smooth skin with very few holes per square metre and consequently good barrier properties. One remaining challenge is to make the nanocellulose flexible enough so that the coating doesn’t get brittle and crack when it dries. “That’s what I’m working on now. A lot of work in the field is being done around the globe, and I strongly believe that this is something that can be solved relatively soon. If we’re able to replace plastic packaging with this kind of packaging, both the consumer and the environment win,” says Ottesen.